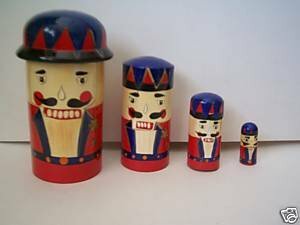 This is a set of old nesting dolls seem to resemble Nut Crackers with their soldier suits and large teeth. There are a total of 4 dolls, made of wood. Largest is 5-1/2 tall. In good condition, all paint is intact, made in China.